World News on THE ENVIRONMENTALIST: "A Success Story in the Middle East"
"A Success Story in the Middle East"
A recent conversation with Qubad Talabani, the Kurdish representative to the U.S. for their regional government, centered on what the son of Iraq's President Jalal Talabani called the U.S.'s success story in the Middle East. It was during an interview that covered politics, religion, Turkey, Iran, and the Kurdish attitude toward the U.S. for their involvement in Iraq. 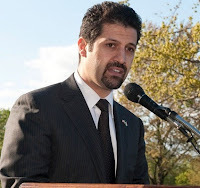 As Qubad Talabani stated, "there is a success story in the Middle East that has significant U.S. fingerprints on it and I can't point to too many of those right now in the Middle East. " A 2007 profile described the Iraqi president's son as "English-accented, a onetime Italian-car mechanic with an American wife--[who] handles his duties with aplomb, rushing around town in subtle suits to meet with policy makers and power brokers." The Italian cars and the mechanical engineering degree have since given way to the mechanics of diplomacy. My interest in the Kurds began with research for a book. Their history and culture are fascinating to me. I became aware of Qubad Talabani as part of that research and have watched his transformation from Kurdish exile raised in Britain to the diplomat on the Washington scene. Mr. Talabani was candid, engaging and achingly interested in putting across to the American people what the Kurds have accomplished and how much of that progress they attribute to past, current, and - emphasized - ongoing U.S. engagement in the region. We started with his father's reelection as president of Iraq and the confirmation of Jalal Talabani's objection to the death penalty, which came up when he said he would not sign the execution order for Saddam Hussein's former Deputy Prime Minister and Foreign Minister,Tariq Aziz. It was one of many times during our discussion that I was reminded of how different the Kurds were than perceptions of them by many in the West. 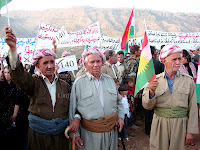 That difference was evidenced by a statement from Qubad Talabani about a growing nationalist movement among Kurdish youth that had them turning from Islam to Zoroastrianism, the ancient religion of the Kurds when they were known as the Medes. It is a faith that includes as its precepts: tolerance toward other religions, protection of the environment, equality of the sexes, truth, and loyalty toward family, country and God. There's no evidence of a wider movement, though those in Iraqi Kurdistan are now free to explore that option. Most Kurds are Muslim and it is practiced by those in rural areas. But even there, it is not the same as in other parts of the Middle East. I brought up a saying I'd heard: 'Kurds hold their Islam with a light touch.' Mr. Talabani explained the phrase, "Kurds are Kurds first today and, in my opinion, it's because - when we were being massacred - nobody came out in the Muslim world to say: 'hang on a minute. This is wrong.' No religious authority from Cairo or Saudi Arabia or any of the other epicenters of the Muslim world came out and said here are Muslim brothers being massacred by supposed Muslims in the form of Saddam's Iraq. That's gone a long way, again, toward increasing nationalism, which I believe is a defensive ideology. Nothing instills nationalism more than oppression and fear." In Iraqi Kurdistan, nationalism is the common belief in a distinctly pluralistic society where the Kurds have opened their gates to Iraqi Christians seeking refuge from extremist violence. "We've had this welcoming policy [to Iraqi Christians];" Mr. Talabani explains, "we've probably settled in Kurdistan 12,000 to 15,000 Christian families and, regrettably, hundreds of thousands have left Iraq altogether. Those who've chosen not to leave Iraq have resettled in Kurdistan." They've shown the same tolerance toward other religious minorities. Problems, when they do arise, are cultural in nature. Mr. Talabani was candid about the challenges faced by women in their rural regions, with crimes of honor killings and female genital mutilation, on which he said, Kurdistan, unlike other parts of the Middle East, reports and has begun work to stop. It won't be easy. In the male dominated culture that exists in the rural areas, he points out that it will take religious leaders and villages elders to change the practices. There has been some progress in those efforts, including a statement by the Kurdish Islamic authority to condemn the practices, but, as he said, "we can't shy away" from the problem. There's more work to be done. That's in contrast with the high participation of women in their parliament, their presence in the armed forces (Peshmerga and police), their access to education and activities in civic life. The cities of Iraqi Kurdistan are booming. There's money from oil and billions in investment from foreign companies, pouring into everything from resource development to mega malls. The regional government has built an information technology academy, a police academy, water and grid infrastructure improvements with electricity to near prewar levels, unlike the rest of Iraq. Also unlike the rest of the country, Iraqi Kurdistan is verdant, cooler in summer, snowy in winter with tall mountains, wildflowers, rushing rivers and waterfalls. "Iraqi Kurdistan is to me..." Talabani said, "I consider it a vibrant, thriving, civil society in the heart of a turbulent Middle East. I view it as this beautiful part of the world with majestic mountains, sweeping valleys with a natural beauty that is unrivaled, but with a population that has seen so much tragedy that has instilled in us an enormous sense of national pride." That pride includes the fact that there has not been, to date, any U.S. casualties due to hostile action in Iraqi Kurdistan. This is because the Kurds, as Mr. Talabani points out, like Americans. "It's important for Americans to know that out of the nearly five thousand U.S. casualties in Iraq, not one of those casualties have occurred in the Kurdistan region," he said, "we've not lost one U.S. serviceman or civilian, for that matter, in Kurdistan, through hostile action. We're proud of a statistic that always makes us knock on wood because we want to keep it that way. Why is it? First and foremost, Kurds, by and large, view the United States as liberators. We didn't view you as occupiers. We liked the fact that you were there." Talabani acknowledged Western concerns that the Kurds might be too close to Iran, but defied those making the statements to prove that anything has been done against U.S. interests. "What I've told those who've expressed their concern about Kurdish closeness to Iran," Talabani said, "is find me one example where we have carried out an action or a policy that has been consistent with Iran's interests and, at the same time, detrimental to U.S. interests. We haven't done it. Of course we want to have good relations with all of the countries that we live next door to. We didn't pick the neighborhood that we live in. It picked us." He was more specific about another neighbor. "Turkey has transformed from this secular, cold war ally of the United States," he explained, "[which was] Atatürk Kemalist's vision, pro-Israel, another non-Arab, pro-Israeli group of democrats who were secular in the Middle East. That was the perfect combination of attributes for the United States at the time. That is no longer the same Turkey. Turkey has changed. Turkey has a new government, a new government with a new mandate; a new platform - a very strategic and systematic shift in policy which places its emphasis on the region of the world it lives in." This brought up the problem of Kirkuk, a city that straddles the Iraqi Kurdistan border atop vast oil and gas reserves. Saddam Hussein depopulated the Kurds from the city, leveling whole neighborhoods, and replaced them with Arab and Turkomen families. Resolving the issues of property rights and administration of the reserves has become what Mr. Talabani called "messy." It's messy because everyone has claim to the province with its oil. The Arab and Turkomen families established by Saddam have lived there a generation. The Kurds that were displaced have come back to demolished homes and streets. The inclusion of the Turkomen garners Turkey's interest, as does the oil and, especially, their concern about Kurds expanding their territory should they be given the administration of Kirkuk. The Turks watch this because they have their own large Kurdish minority which is not at all as well off as the Iraqi Kurds. A rebel Kurdish group out of Turkey, the PKK, which encamps just over the Iraqi border, has been declared a terrorist group by the U.S., EU and Turkey. The PKK does not have the support of Iraqi Kurdistan but have not been dislodged from their mountain camps in the north of Iraq. The U.S. has been working with Turkey to improve the lot of the Turkish Kurds, which could reduce support for the PKK within Turkish borders, but one has to wonder what it would take to improve their situation enough, when they can look across the border at a thriving Iraqi Kurdistan while they struggle to survive. Oil was another topic for conversation. Foreign investment has been coming into Iraqi Kurdistan like a spigot opened on a well-head. They recently held a ceremony to open a facility near Erbil. Deals have been made with scores of companies. The Kurds are open for business. Their position on the resources is that it's their investment fund, there to help them develop their society. "The oil of Iraq," Talabani explained, "has been a curse for the Kurds since Iraq's inception. We've never truly benefited from our so-called natural resource. On the contrary, this resource has been used to fund the war of genocide against the Kurdish people. So, for the first time, we have an opportunity to develop our oil and gas sector with the hope of reinvesting the proceeds of the sale of that oil and gas into developing infrastructure, into our educational sector, into our agricultural sector." The genocide to which he refers is Saddam's Anfal Campaign of the late 1980's. During that time, the Kurds of Halabja in Iraqi Kurdistan were gassed from the air in what still is the largest poison gas attack upon a civilian population. The description of that gassing is horrific, with many of its victims women and children. More Kurds were rounded up and disappeared in what the Iraqi High Criminal Court has, just this past year, declared a genocide against the Kurdish people. The Kurds feel this loss at their core and are still recovering their dead. There was a ceremony recently in their capital city, Erbil, where the bodies of long-missing Kurdish children were returned to their families. The Iraqi Kurds' peaceful society is a testament to their growing maturity. They've seen violence used against them and between their own factions in an outbreak of internecine conflict during the 1990's. They resolved the differences with the support of the Clinton Administration and formed a government with the two parties (Patriotic Union of Kurdistan and the Kurdish Democratic Party) that power-share in their semi-autonomous region. The Kurdish parliament held an election in 2009 where a third group known as the Change List -- in opposition to the two primary parties -- took twenty-five seats. They are building their democracy. Given the past horrors to which they'd been subjected, the Kurds have no patience for extremist groups like al Qaeda. "Our society does not tolerate the so called insurgency," Mr. Talabani was adamant, "Al Qaeda tried to set up a base in Kurdistan after it knew it was going to get hammered in Afghanistan. The intention was to set up a base of operations in Kurdistan and it couldn't because the society there, although it was predominantly Muslim, although it was in the rural areas predominantly conservative, it was just not tolerant of that intolerant ideology. " The impression I took away from the interview was that the Kurds have more in common with the West than the American public has been made aware. They are sophisticated in their understanding of the fickle nature of world powers. They know the Iraq War was unpopular and have their own take on the U.S. invasion of Iraq that that differs from the one offered by the Bush Administration. "There's what I wished America came into Iraq for and what they did come into Iraq for," Talabani explained, "I think that, ultimately, after 9/11, there was a new order and a new state of play in the world and the United States was leading the charge. Saddam was viewed with weapons of mass destruction as a mortal threat to say peace, stability, of allies in the region and, by extension, the United States. That's why the principle argument for the liberation of Iraq was that Iraq had weapons of mass destruction. We were quietly, publically, actively trying to inject into the justification for this war issues of human rights violations, issues of genocide against the Kurds, issues of genocide against Iraqis, issues of torture and of the constant struggle of many Iraqis - the lack of political freedom, so all of the stuff that is not considered important in world politics, regrettably." What's not regrettable from the Kurds' point of view is the formation of their semi-autonomous region and the relative freedom they now enjoy while they pursue opportunity and manage the associated growing pains that come with the rebuilding of a diverse society. "What the world is looking for, in particular, what we are looking for as Kurds," he pointed out, "is a clear vision from the United States. What are its core interests? What are its core principles? We see the debate in the United States. We know that there is Iraq fatigue. We know that there is a world economic crisis the United States is caught up in and is suffering as a result of it. We know all these things. We're reading the tea leaves. We've become more astute in observing political reality. If the United States is serious about a long-term commitment with Iraq, we're ready." In reference to a comment by President Obama that America was 'turning the page in Iraq', Qubad Talabani responded directly. "You’ve talked about promoting democracy. It’s starting in Kurdistan. Embrace it. Support it. Defend it. You want to talk about energy security. It’s starting in Kurdistan. We can apply it nationally. Counterterrorism is happening today in Kurdistan. All of the things that we have hoped for in broader Iraq are today happening in the Kurdistan region of Iraq." The Kurds understand the difficulty of President Obama's position. Mr. Talabani referred to the American president as "caught between Iraq and a hard place" and said he knew how that felt. To this, he added, "What would be nice for Americans across the political spectrum to know is that you have a friend in the Kurds. And even though there may be times when we might disagree with one another, this friendship we feel is strong, is deep, and is based on core values and core principles." He closed with: "There is a success story in the Middle East that has significant U.S. fingerprints on it and I can't point to too many of those right now in the Middle East. This success story needs to be embraced. It shouldn't be feared. It needs to be developed. It shouldn't be ignored. I'm hopeful this administration along with future administrations in the United States will appreciate this and help us where we need help, guide us where we need guidance, work with us when we need to be worked with. " The full interview transcript is available at this link. On THE HUFFINGTON POST at this link.